Put the chicken in a big pot, with some chopped onion (large pieces are easier to remove later) and some celery, some salt (to taste) and garlic powder. Let this come to a boil and then cover and simmer until the chicken is cooked fully. I usually leave mine on for like an hour or more. While the chicken is cooking, you can mix up your dumplings. I’ve listed the amounts for a normal batch, but for our family we make a double batch – and there’s never enough dumplings. Combine the flour, baking soda and 1/2 teaspoon of salt; cut the shortening into the flour with a fork or a pastry blender or two knives… whatever you have, until the flour mixture has the consistency of coarse meal. Add the buttermilk, stirring just until the dry ingredients are moistened. Turn the dough out onto a floured surface (like making biscuits) and knead four or five times – but no more than that, otherwise your dumplings will be tough. And who wants tough dumplings? Now I like to pinch off about a ping-pong ball size of dough, roll it up into a little ball and then set it on a plate and repeat with the whole batch of dough. Then I stick that plate into the fridge until I’m ready to drop in the dumplings. After that’s all done and your chicken is cooked, get out a big bowl and a strainer. You’re going to drain the chicken stock through a strainer into the bowl. The strainer catches all the chunks of onion and celery and the chicken, leaving you with your stock. Pour the stock back into the pot. In a large pan, seperate your chicken from the bone and skin and all that, put the chunks of chicken into a seperate bowl and stick that into the fridge. Turn up the heat under your pot to get your chicken stock boiling again. Once it is boiling add the can of evaporated milk. Now get out your plate of dumplings and drop them in (one at a time, but quickly so they all have relatively the same cook time). As the dumplings cook, they’ll rise back to the top. Turn down the heat to a simmer and put a lid on the pot and allow your dumplings to cook for ten to fifteen minutes. When we started this blog in 2010, we had three children. Since that time we have had THREE MORE CHILDREN. 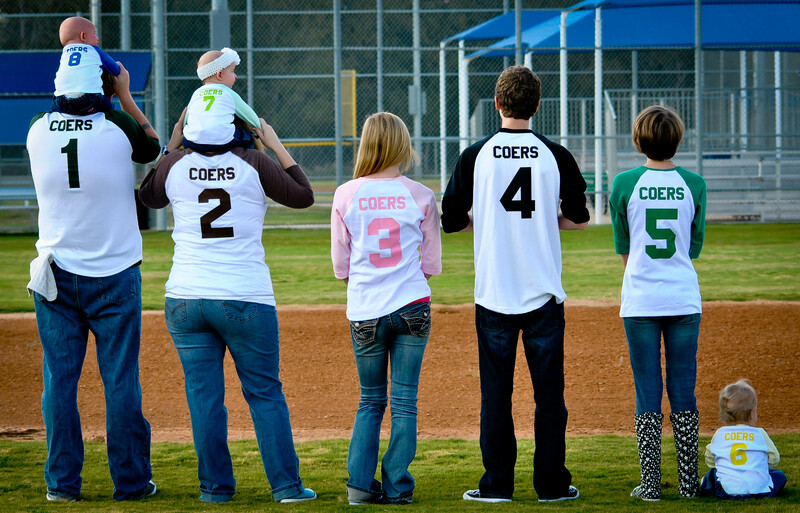 We would love for you to visit us at www.coersfamily.com to see how we’ve grown.